Is 2014 the year of big-screen slates? Reports of increasing screen resolutions and sizes stomping into CES 2014 continue to heap on, and today fresh rumors say Samsung will also introduce a 10.5-inch tablet at the tech show. Sources whispered to the ET News that Samsung could introduce a 10.5-inch AMOLED tablet in early January, likely at Las Vegas' tech-stravaganza. 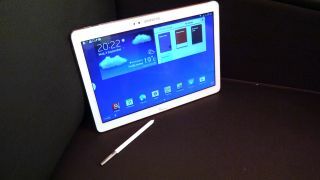 The Korean media got hold of a shipping manifest describing the tablet, which at the moment is only known as the SM-T331. Theories suggest it could be a larger variant of the upcoming Samsung Galaxy Tab 4 and both could be high-end devices meant to compete with the iPad Air and iPad mini 2 with Retina display. There weren't any specs or a screen resolution attached to the report. However, at 10.5-inches this tablet could turn heads simply by having a bigger (but not biggest) screen around compared to the 9.7-inch iPad Air and 10.1-inch Surface Pro 2. While news of a 10.5-inch AMOLED screen sounds impressive, previously we heard Sammy would also bring forth a Galaxy Note sporting a 12.2-inch display. Having cleared the FCC's certification process, the new Note 12.2 is slightly more concrete than its 10.5-inch brethren. Earlier reports have suggested the larger slate will feature a 2560 x 1600 resolution screen and Exynos 5 octacore CPU. In another clash of the electronic titans, Apple is also supposedly testing a 12.9-inch iPad Pro with 2K and 4K resolution displays. Are 10-inch and up tablets going to be the new fad? It's too early to say for sure, but we'll be on the hunt for large-and-in-charge slates at CES. Ahh. That's the sound of your kids keeping quite with Nokia's new Lumia game.